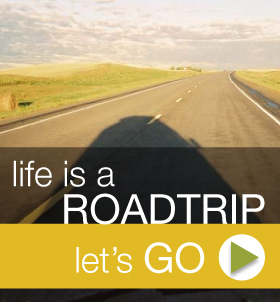 We opt for another early start to beat the daytime winds, and we enjoy a beautiful drive toward the mountains. This morning dawns so crisp and clear that the Front Range of the Rockies, yesterday just blue mounds in the hazy distance, are now so near that we can almost touch them. When uninitiated roadtrippers ask why we don’t just fly someplace and take a cab, this is one of the magic moments that springs to mind, and it’s difficult to explain. We stop at a memorial marking Meriwether Lewis’ Camp Disappointment. On the expedition’s 1806 return journey from the Pacific Ocean, Lewis ventured up the Marias River from the Missouri to determine if its origins lay somewhere north of the 49th parallel, which would mean moving the Canada-United States border farther north, significantly increasing US territory. Turned out it was about twenty-five miles short, hence the name. 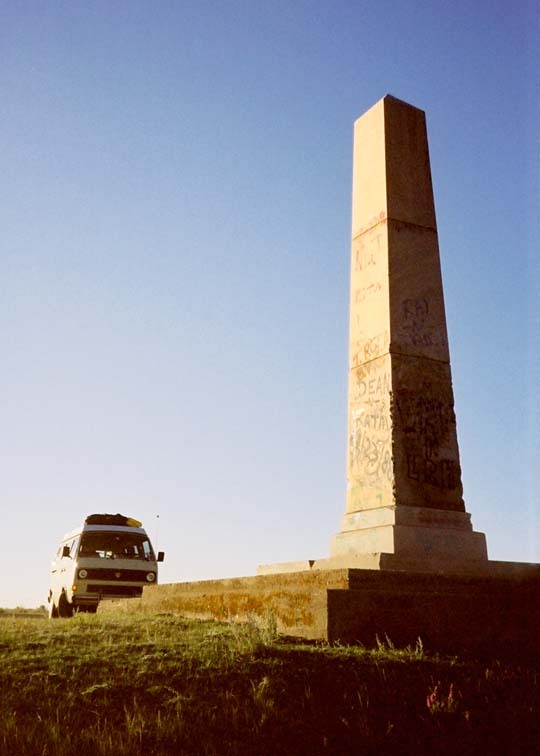 Blackfoot delinquents from nearby Browning and Cut Bank have liberally defaced the granite obelisk with spray paint and markers, leaving names like Alex Bull Calf, Kathy Spotted Eagle, and Jim Bird Rattler. Never an advocate of vandalism, I’m not sure if I blame them for crudely scrawling their names over those of the white invaders who came and made monuments to themselves, but it seems a shame nonetheless. St. Mary is perhaps the most dramatic approach to Glacier, offering a broad vista of morning-lit rocky peaks, green valleys, and icy-blue lakes even before entering the park. 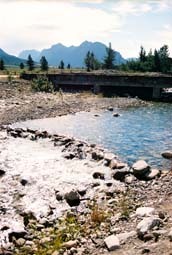 A stop at the visitor center here offers a good overview of Glacier, with a short introductory film and exhibits of local flora, fauna, and human history. At the gate we buy our park pass, then motor a few miles up to Rising Sun campground to select a cozy site among the cedars. After more than three long days and over fifteen hundred miles of driving, most of it over a landscape with as many terrain features as your average coffee table, we are glad finally to be here, the Westy dozing in the cool shadows of these magnificent mountains, with our name on the little slip hanging on the numbered post. We have indeed arrived. 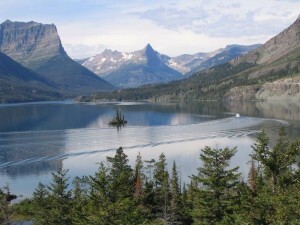 It can safely be said that Glacier National Park might not exist today were it not for the diligent efforts of George B. Grinnell, a young outdoorsman and explorer who first came here in the fall of 1885. Editor of Forest and Stream magazine, and a big player in wildlife preservation and conservation movements, he hunted, hiked, and camped in the region for many years, and was instrumental in seeing it set aside as a natural sanctuary. Grinnell and his preservationist ideals also had the ear of a young New York State Governor by the name of Theodore Roosevelt, for whom Grinnell would later serve as presidential conservation speechwriter. 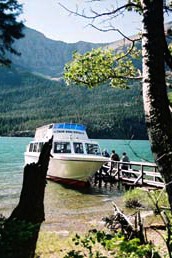 We stroll over to the dock to take in a boat ride on St. Mary Lake. It’s a leisurely cruise along the long and narrow glacier-carved valley, over emerald waters made milky by finely pulverized rocks up on the mountains. On the southern shore of St. Mary Lake one can still see the crumbled remains of a personal lodge built for Louis W. Hill, son of J.J., founder of the Great Northern Railway. It was a real swanky joint in its day, with hardwood floors and chandeliers and stuff. Problem was, there were no roads to this remote, wilderness location; the only access was by boat, similar to the one on which we ride today, and poor Louis was deathly afraid of water. After our boat ride, and a bit of needed shopping in St. Mary (after yesterday’s Ice Cream Incident, I need a new pair of sunglasses), we head back into the park and see a hitchhiker waiting at the gates. Lanky, with long red hair, he wears shower flip-flops and holds a little hand-scrawled sign that reads: “Rising Sun”. That’s our campground, and I seem to recall seeing him camped there earlier, so we pick him up. On the short drive to the campground, we learn that his name is Geert, he is originally from Belgium, and is currently in the midst of backpacking most of the Continental Divide from southern Canada down to Mexico. 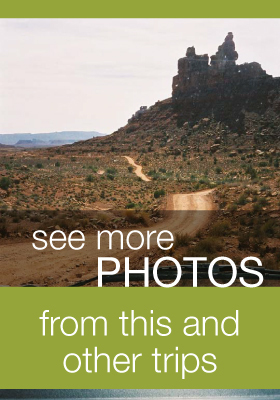 When winter finally settles in for good, he will rest somewhere in South America for a few months, then return to hike the American Southwest portions of the Divide. He tells us of his travels so far, his perceptions of our country, and the unfortunate fact that due to the Bush administration’s dismal diplomacy, Americans are increasingly unwelcome in so many places abroad. After dinner in camp, we stroll over to take in a ranger presentation on wolves, which have re-introduced themselves into the far northwestern corner of Glacier, having immigrated from Canada. We intend to spend a day or two in that remote area later during our trip, and hope to hear their evocative calls in the night. 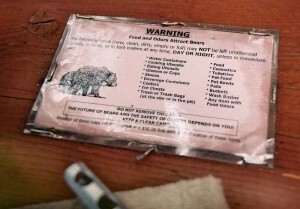 Returning to camp, we find an official warning notice waiting for us. It is signed by Howard, The Camp Host. Having just arrived this morning, we’ve only made one meal here, and have been impeccable in our housekeeping habits. Searching around our tidy campsite, I cannot see what on earth Howard is upset about. His mention of my green duffle bag, and emphasis of “food and water containers”, draws my attention to the Westy’s rooftop luggage bin, where I spy our spare fuel can. He must have hastily determined that it contained water or Kool-Aid or something else tempting to bears and imperiously written me the warning. “I presume Howard the Campground Host refers here to the standard, yellow plastic five-gallon fuel can stored in my rooftop cargo rack, and which is clearly marked “DIESEL” and “DANGER”. Common sense and many state laws prohibit carrying such a fuel container inside a passenger vehicle. I sign it “Campsite 47”.